Easter Week is probably the most important event on the Catholic calendar. 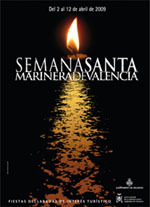 In Valencia, its celebrated almost exclusively in the maritime district… which is why it’s called the Semana Santa Marinera. There are an enormous amount of events scheduled from April 2nd to April 12th, with a number of different brother and sisterhoods taking part. Most of these are processions in and around Cabanyal. As a good ‘ole American farm boy, I was terrified last year to see groups of men in white, pointy hoods marching down the street. Of course, these guys have nothing to do with certain other organizations. Different brotherhoods wear different colored robes — the pink ones are especially cute. But what is the significance of the pointy hoods? Even without the KKKonnektion, they come off threatening. The main parades take place on Thursday, Friday and Easter Sunday. Sunday’s will be the most colorful and probably of the most interest to non-participants. And on the morning of Good Friday, the brotherhoods take their act to the beach… one of the more impressive acts of the Semana Santa. 20 Minutos has a great slideshow from last year’s holy week. It’ll give you a good idea of what’s in store, should you feel the urge to go spectate.